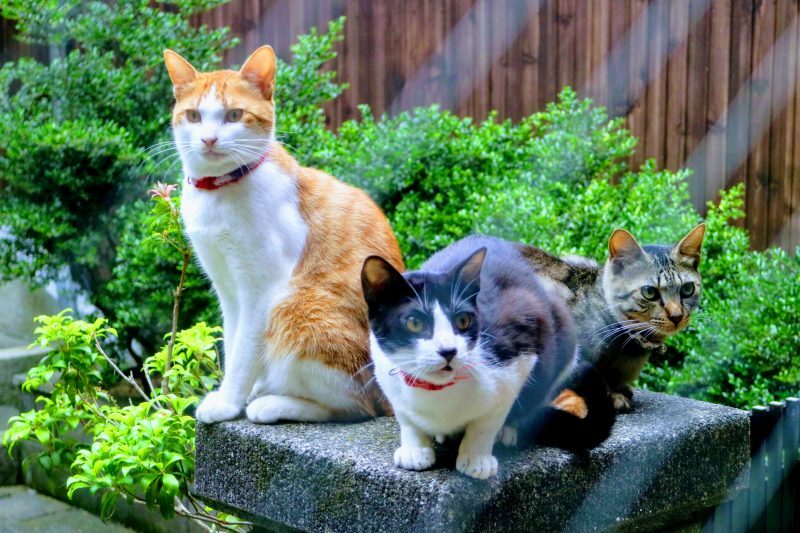 Cats at a temple in Obama, Japan, perhaps thinking of pots. Photo by Nevin Thompson. Used with permission. A blogger by the name of 写メんなよ (shamen-nayo)  made a surprising discovery on November 7, the “Pot Day” (鍋の日, nabe no hi) in Japan. Donabe (traditional Japanese earthenware pots) are such commonly used cookware in Japan that there is a special day for eating food in them. To celebrate this year's Day of Pots, many Japanese users had posted photos of hot pots and stew on Twitter. Among those photos, however, were also pictures of furry felines stuffed in pots of all shapes and sizes. Speaking of pots, Ramochi is introducing “cat-pots”! It turns out that cat-pots aren't just for the Day of Pots. These furry felines have already been chilling in pots for a while. It's not only big cats in big pots; little kittens are also joining in on the fun with their own tiny pots. Wouldn't they go in if you place the pots? It seems that cat-pots have taken Japan by storm with their ability to “癒す”, or soothe and comfort the viewer. After all, who doesn't love cute cat photos? For more adorable photos of cats in pots, visit 写メんなよ's Naver Matome post .